Seen when trying to connect to the Exchange 2010 Management Console. The following error occurred while searching for the on-premises Exchange server: No Exchange servers are available in any Active Directory sites. You can’t connect to remote Powershell on a computer that only has the Management Tools role installed. It was running the command ‘Discover-ExchangeServer -UseWIA $true -SuppressError $true -CurrentVersion ‘Version 14.1 (Build 218.15)”. Even though it looks like it’s something pretty serious, it isn’t. You are simply logged on as a user that does not have the rights to run the management console. This commonly happens when you logon to the Exchange server as the servers local administrator. 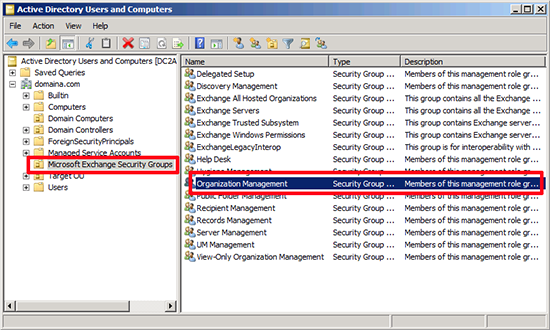 You need to be logged on the the Exchange server as a user that is a member of the ‘Organization Management’ group.